Vienna lies a short five-hour train ride from both Munich and Prague, making the city a convenient destination to reach by either air or rail. Once in Vienna, you’ll find that most attractions are concentrated in the city's central core, the Innere Stadt, which is easily manageable by foot and public transportation. Vienna International Airport in Wien-Schwechat (www.viennaairport.com) is about 12 miles (19 kilometers) southeast of the city. The City Airport Train (www.cityairporttrain.at) connects the terminal with Wien Mitte train station in just 16 minutes for € 9.00. Buses (www.postbus.at) cost € 6.00, leave every 20 minutes, and stop in the center at Südtiroler Platz (20 minutes), Südbahnhof (25 minutes), and Westbahnhof (35 minutes). The S7 S-Bahn service for € 3.60 is the cheapest (www.oebb.at) but also the slowest one (35 minutes or more). It leaves approximately every 30 minutes for stops at Wien Mitte and Wien Nord. By train, you arrive in Vienna at Westbahnhof or Südbahnhof. The U-Bahn (subway) and tram system runs between these stations and the center of town. Vienna is divided into 23 districts. At the core is the first district, the Innere Stadt, with the Stephansdom and the Stephansplatz at the center. Being Vienna's old town, the Innere Stadt contains most of the city's famous structures and is characterized by narrow alleys and monumental buildings. The first district is easily manageable by foot and public transportation. Surrounding the inner city is the Ringstraße, or Ring, a circular boulevard constructed along the old city walls, which were torn down at the end of the 19th century. Along the Ringstraße you can find many famous and grand buildings, including the Rathaus (City Hall), the Austrian Parliament, the Hofburg Palace, the Natural History Museum, the Kunsthistorisches Museum (Museum of Art History), and the State Opera House. The Innere Stadt is situated away from the main flow of the Danube, but is bounded by the Donaukanal (Danube canal) on the northeastern side. Beyond the Ring but within the Gürtel (belt road), which runs parallel to and encircles the Ringstraße like an outer belt, are the districts two to nine. The second district, also named Leopoldstadt, encompasses the famous Prater, formerly the hunting and riding preserve of the aristocracy, but nowadays a public park with a stadium, fairgrounds, racetracks, and many restaurants. The Westbahnhof (western railway station) can be found in the 6th district. From there, the major shopping street Mariahilfer Straße leads eastwards toward the inner city, the Hundertwasserhaus and Hundertwasser Kunsthaus in the 3rd, and the Belvedere Palace. Beyond another ring road, the Gürtel, lie the outer suburbs, districts 10 to 20 which are largely residential but also contain a large number of parks and other green areas, some of them reaching far into the Wienerwald. Sites of interest are the Danube Tower (Donauturm) and notably Schönbrunn Palace, which is one of the most visited tourist attractions of the world. It was placed on the UNESCO World Cultural Heritage List in 1996. The first item is the street name, followed by the building number and the appartment number usually separated by a /. Sometimes you might see more numbers like 25 / 3 / 1 / 7 – then the second number (Stiege) usually refers to the number of the building inside a larger building complex and the last number before the appartment number denotes the floor level. Keep in mind that in Vienna floors are counted from 0 up. The Erdgeschoß (ground floor) is the lowest level, 1. Stock is the first floor above it. In some buildings you will also encounter a Halbgeschoß or Mezzanin, which is a level between ground floor and first floor and which is usually not counted. The number in the second line is the postal code (zip). For Vienna, this always starts with a 1. The next two digits are the number of the district (16th district in our example). And the last digit is an internal postal code used by the mail system. Building numbers increase outwards from the city center, with even and odd numbers on the opposite side of the street. Street signs usually have the number of the district prefixed as a Roman numeral. Vienna has one of Europe’s best public transport networks, which includes underground, trams (trolleys), buses and commuter rail. 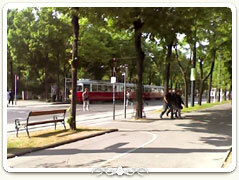 The subway system will take you to within a few minutes walk of anywhere you are likely to want to visit. Flat-fare tickets are valid for trains, trams, buses, the underground (U-Bahn) and the S-Bahn regional trains. Services are frequent, and rarely you will have to wait more than five or 10 minutes. Public transport kicks off around 5am or 6am. Buses and trams finish between 11pm and midnight, and S-Bahn and U-Bahn ser­vices between 12.30am and 1am. Twenty-one Nightline bus routes crisscross the city from 12.30am to 5am. Schwedenplatz, Schottentor and the Oper are starting points for many services; look for buses and bus stops marked with an ‘N’. All tickets are valid for Nightline services. Transport maps are posted in all U-Bahn stations and at many bus and tram stops. Free maps and information pamphlets are available from Wiener Linien (7909 100; http://www.wienerlinien.at/; information line 6am-10pm Mon-Fri, 8.30am-4.30pm Sat & Sun), located in nine U-Bahn stations. The Karlsplatz, Stephansplatz and Westbahnhof information offices are open from 6.30am to 6.30pm Monday to Friday and 8.30am to 4pm Saturday and Sunday. Those at Erdberg, Floridsdorf, Landstrasse, Philadelphiabrücke, Praterstern and Schottentor are closed on weekends. Tickets and passes can be purchased at U-Bahn stations – from automatic machines (with English instructions and change) and occasionally-staffed ticket offices – and in Tabaks. Once bought, tickets need to be validated before starting your journey (except for weekly and monthly tickets); look for small blue boxes at the entrance to U-Bahn stations and on buses and trams. Just pop the end of the ticket in the slot and wait for the ‘ding’. It’s an honour system and ticket inspection is infrequent, but if you’re caught without a ticket you’ll be fined €60, no exceptions. 8-Tage-Karte (Eight-day Ticket; €27.20) Valid for eight days, but not necessarily eight consecutive days; punch the card as and when you need it. 24-Stunden Wien-Karte (24hr Ticket; €5.70) Unlimited travel for 24 hours from time of validation. Fahrschein (Single Ticket; €1.70) Good for one journey, with line changes; costs €2.20 if purchased on trams and buses (correct change required). Monatskarte (Monthly Ticket; €49.50) Valid from the 1st of the month to the last day of the month and transferable. Streifenkarte (Strip Ticket; €6.80) Four single tickets on one strip. Wiener Einkaufskarte (Vienna Shopping Card; €4.60) For use between 8am and 8pm Monday to Saturday; only good for one day after validation. Wochenkarte (Weekly Ticket; €14) Valid Monday to 9am Monday. Children aged six to 15 travel for half-price, or free on Sunday, public holidays and during Vienna school holidays (photo ID necessary); younger children always travel free. Senior citi­zens (women over 60, men over 65) can buy a €2 ticket that is valid for two trips; ­inquire at transport information offices. Being an old city with a sad history of neglecting traffic planing, driving in Vienna can be a pleasant or horrible experience. While the outer suburbs provide good streets and parking, the closer you get to the inner city, the narrower streets become and parking becomes a serious problem. In many cases, you are better off using the excellent public transport system. If you do plan to drive in the city, take special care of pedestrians and the trams. Trams always have priority and vehicles must wait behind them when they stop to pick up or set down passengers. Pedestrians have the right of way in crossing all roads at a Zebrastreifen (crosswalk) – you are required to yield to any pedestrian at this crossing! Many Austrians will step out at a Zebrastreifen with little thought and force you to stop. So drive slowly and carefully. In the smaller neighborhoods (including the first district, where it is hard to differentiate between sidewalks, pedestrian-only streets and regular streets anyway), this right of way is an understood rule at every intersection, although pedestrians will be more careful, if only a bit, before they step out. Again, be on the lookout for this: if you see a pedestrian waiting to cross, you should stop at the intersection for him or her. We do not recommend driving a car within the Innere Stadt. While cars are allowed on many of the streets there, the streets are narrow and mostly one-way. They can be confusing for a visitor (they are for us Viennese) and parking is extremely limited. Parking in the districts one to nine and 20 and in specially marked areas (displaying Kurzparkzone - short stay parking zones) is restricted to 120 minutes (between 9:00 and 22:00) and subject to a fee of € 1.20 per hour. Payment can be made either by marking the time of arrival on a Parkschein (parking voucher) and displaying it on your dashboard or, depending on your carrier, by mobile phone. Motorcycles are excempted from this fee. Parkscheine are colour-coded and come in 30-/60-/90-minute lots (€0.60/1.20/1.80 respectively) and can be purchased at Tabak-Trafik (tobacconist shops), banks, train stations and Wiener Linien ticket offices. A free 10-minute voucher is also available. Another option is to park at a commercial car park, which however can become quite expensive (about € 30.00 per day). Peak hours in Vienna are Monday to Friday from about 7:00 to 9:00 and 15:30 to 18:00. On friday, the afternoon peak hour starts a bit earlier. During these times especially the Ringstraße and the Gürtel suffer from heavy traffic congestion. Although you can see most of the major sites in Vienna on foot, you may prefer the comforts of a taxi for trips from the airport or train station to your hotel. Be aware that taxis usually need to be hired at stands located throughout the city or call for one (www.wieninfo.at). You pay a 1€ ($1.20) surcharge for luggage Rides to the airport (%676-380-5797; www. airportservice.at) also cost extra, or you can get a taxi for a flat rate, around 23€ to 43€ ($28–$52). Vienna has everything from tours to horse-drawn carriage rides, so if you are looking for a guided tour of the city you will find something to suit you. Bus tours are good if you're very short on time and want to pack in as much as possible, while the walking tours are perfect if you are are interested in learning more on a specific topic. Fiaker - More of a tourist novelty than anything else, a Fiaker is a traditional-stype open carriage drawn by a pair of horses. Drivers generally speak English and point out places of interest en route. Lines of horses, carriages and bowler-hatted drivers can be found at the Stephansplatz, the Albertinaplatz and at the Vienna Hofburg. Guided walks, i.e. discoveries on foot, are offered, among others, by the “Walks in Vienna” (Wiener Spaziergänge): find them on the Event Database and the monthly program put out by the Vienna Tourist Board. They offer set dates and a great variety of topics: from “The Musical Capital of the World” to “Art Nouveau and Turn of the Century” to “Paths of Pleasure in Old Vienna.” If you prefer things really personal, let one the Vienna Guides show you around the city - you'll find a "suitable" city guide in our Guide List .